There are many views on the theological significance of 9/11, especially as it relates to God's judgement upon our nation. David Wilkerson (1931-2011), the founding pastor of Times Square Church and a brother of impeccable renown, wrote a seminal piece about this which I highly recommend: The Towers Have Fallen But We Missed the Message. Our family had the distinct honor of spending a private hour visiting with Brother David just days after he penned this powerful message in October 2001. The biblical text of his sermon begins in the ninth chapter of Isaiah; interestingly, the very same place where Jonathan Cahn's recent best-seller, The Harbinger, also begins. Very thought-and-prayer provoking. Personally, that post-prayerwalk trip to New York was a game changer. I was invited to lead a prayer meeting right at the epicenter of the smoldering ruins of Ground Zero. The picture of all those "tough-guy" construction workers, holding hands in a circle...overcome with sobbing...will forever be etched in my heart. Holy ground. While prayerwalking with a group of intercessors through downtown Charlotte, NC, I felt moved to look up at the tallest building in the city, the Bank of America Corporate Center. Suddenly, I saw the building explode before my very eyes, as God shouted in my heart, "I'm bringing revival to the United States!" This vision was so stunning, I thought it was really happening. It took me a while to catch my breath and relay to the other prayer-walkers what I'd just seen. Still shaken by it all, I spoke about it that same evening at a large Assembly of God church in Concord, NC. TWO DAYS LATER, on Tuesday morning, September 11, 2001 (the only Tuesday morning of the entire 3400-mile prayerwalk when our team was not out prayerwalking, but "just happened" to all be staying in the same home, and "just happened" to all be watching the news during breakfast...the only morning we ever did so), when I saw the Towers hit on the news, it was supernatural déjà vu. Exactly what I'd "seen" two days earlier in Charlotte. 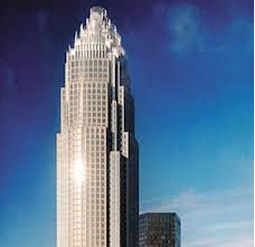 I would later find that the cornerstone of that building in Charlotte actually reads, "United States Building." So, what does all this mean? Is America coming under judgement? Is God bringing revival to the United States? In these sober days surrounding the anniversary of 9/11, with global conflict and turmoil on every side, let's agree together for a spirit of conviction to grab hold of the American Church. The only hope for healing, the only hope for revival, is through God's response to a genuinely repentant Church.